Considering the meteoric rise of Facebook as an advertising platform over the last few years, it’s no surprise that 3rd-party retargeting vendors have been eager to offer advanced, managed services for advertisers by utilizing Facebook’s ads API and the Facebook Exchange marketplace. In the early days of Facebook Ads, options for targeting were limited, the self-service interface was difficult to use, and ad units were too numerous and confusing. However, large retargeting technology vendors, who were at the time pioneers in the space, already had ads – and more importantly, cookies – all across the internet. Thus, the Facebook Exchange (FBX) was born to provide these ad tech companies with a marketplace for Newsfeed ad inventory. For their part, these vendors could guarantee ads were relevant to each individual user based on their browsing history. Fast forward to today, and things look much different when advertisers log into Facebook Ads, in just about every conceivable way. For this post I’ll be focusing on Facebook’s evolved capacity for retargeting natively, without a third-party vendor. An ecommerce advertiser client recently asked us to evaluate their retargeting vendor’s performance as it related to our native retargeting efforts in Facebook (using Website Custom Audiences). This particular vendor, like most, serves ads not only on the Facebook Exchange, but also hundreds of non-Facebook ad networks around the internet as well. Reporting includes click and view-through attribution, and typically no segmenting of ad networks (FBX, Google, others) is offered. With a bit of prodding, however, we were able to get retargeting performance data segmented by Facebook inventory versus all other inventory. The Big Question was whether the third-party retargeting vendor had value for our client that couldn’t be realized through native management. What we found was startling, for a few reasons. The retargeting vendor Facebook-only spend (via FBX) constituted only 27% of the budget. Non-Facebook inventory made up the lion’s share of advertising spend. Our native Facebook ratio of click-through conversions to view-through conversions was 53% / 47% (slightly more click conversions than view-thru conversions). …but, when broken out by ad network, we see that the vast majority of these click conversions actually came from Facebook, while barely any were reported anywhere else. 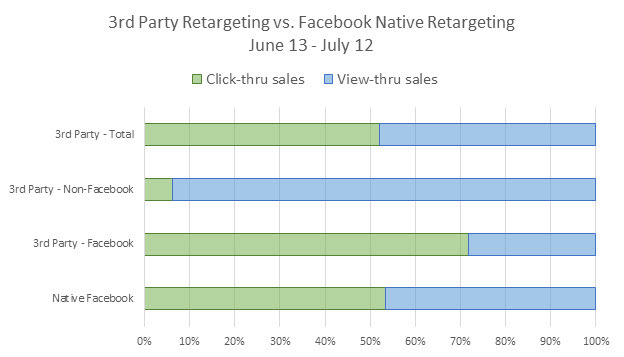 Our click-only cost/conversion was 40% lower in native Facebook versus the 3rd-party retargeting vendor. Based on the data, we decided to move FBX and Google ad inventory to native platforms, which we expect will greatly increase ad spend efficiency – a big win. Have you seen similar discrepancies between third-party and native remarketing performance? Have you checked? Let us know in the comments!